Students ENROLLED in MAY of Last school year received information about which Class to sign up for in the current year. NEW students must sign up for Beginner or Preschool classes unless Evaluated by a Courthouse Instructor. 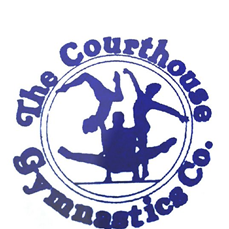 Courthouse Gymnastics may Remove any child registered in the Wrong level class. We are Not Responsible if the correct class is Full. You Must ENROLL IN A CLASS or GO ON A WAIT LIST. PRIVATE LESSONS: Read the Private Lessons Rules on the Registration page. I, PARENT OR GUARDIAN OF THE ABOVE NAME WARD, HEREBY GIVE APPROVAL FOR SAID WARD TO PARTICIPATE IN ANY AND ALL ACTIVITIES OF THE COURTHOUSE GYMNASTICS CO. I ASSUME ALL RISK AND HAZARD INCIDENTAL TO SUCH PARTICIPATION, INCLUDING TRANSPORTATION TO AND FROM PLACES OF ACTIVITIES, AND AT PLACES OF ACTIVITIES, ALSO INCLUDED ARE EXHIBITIONS, OR PLACES OF ACTIVITIES, AND DO HEREBY WAIVE, RELEASE, ABSOLVE, INDEMNIFY AND AGREE TO HOLD HARMLESS ANY ORGANIZATION (THE COURTHOUSE GYMNASTICS CO., OFFICERS, MEET DIRECTORS, SPONSORS, SUPERVISORS, COACHES, PARTICIPANTS AND PERSON TRANSPORTING THE WARD TO AND FROM ACTIVITIES) FOR ANY CLAIM ARISING OUT OF ANY INJURY TO THE GYMNAST/CHEERLEADER. I ALSO VERIFY THAT MY CHILD HAS HAD A PHYSICAL EXAMINATION WITHIN THE PAST YEAR, AND FULL PARTICIPATION HAS BEEN APPROVED BY THE PHYSICIAN. I ALSO GRANT PERMISSION TO MANAGING PERSONNEL OR OTHER REPRESENTATIVES TO AUTHORIZE AND OBTAIN MEDICAL CARE FROM LICENSED PHYSICIAN OR MEDICAL CLINIC SHOULD THE WARD BECOME ILL OR INJURED WHILE PARTICIPATING IN ACTIVITIES AWAY FROM THE HOME OR AT ALL TIMES WHEN NEITHER PARENT IS AVAILABLE TO GRANT AUTHORIZATION FOR EMERGENCY. I UNDERSTAND THAT THE VERY NATURE OF THE ACTIVITY GYMNASTICS /CHEERLEADING CARRIES A RISK OF PHYSICAL INJURY. NO MATTER HOW CAREFUL THE GYMNAST/CHEERLEADER AND THE COACH ARE, NO MATTER HOW MANY SPOTTERS ARE USED, NO MATTER WHAT HEIGHT IS USED OR WHAT LANDING SUFACE EXISTS, THE RISK CANNOT BE ELIMINATED. REDUCED YES, BUT NEVER ELIMINATED. THE RISK OF INJURY INCLUDES MINOR INJURIES SUCH AS BRUISES, AND MORE SERIOUS INJURIES SUCH AS BROKEN BONES, DISLOCATIONS, AND MUSCLE PULLS. THE RISK ALSO INCLUDES AND ALWAYS INCLUDES CATASTROPHIC INJURIES SUCH AS PERMANENT PARALYSIS OR EVEN DEATH FROM LANDING OR FALLS ON BACK OR NECK. I HEREBY ATTEST THAT THIS FORM HAS BEEN COMPLETED BY A PARENT OR LEGAL GUARDIAN OF THE REGISTERED CHILD. ENTERING YOUR FULL NAME BELOW WILL SERVE AS YOUR LEGAL SIGNATURE. PLEASE READ OUR RULES AND POLICIES on our website FOR MORE INFORMATION ON THE FOLLOWING SUBJECTS. PAYMENTS- Monthly tuition and Reg. Fee must be paid by automatic payment/draft from a checking or credit card account . Registration Fee and monthly Tuition are Non-refundable and Non-transferable. All gymnastics students are drafted $15 exhibition fee in April. Regardless of Who is Paying a child's tuition, the Parents/Guardian are Always Responsible if payments are not made. If your Draft is Returned/ Declined by your bank or credit card company for Any Reason including the customer NOT UPDATING their bank or credit card information, the customer's account will be a charged a $25.00 returned fee. If your Draft is Returned/Declined, you Must bring CASH only for the draft amount plus the $25 fee No Later than 3 business days after Email notification of return is emailed to you. If cash payment is Not made in full by 6:30pm on the 3rd day, your child will be Dropped from our program. Do not ask us to reprocess your draft. You must bring Cash. If you Do Not Want to Pay by Draft after registration and first month tuition Advance payment options are listed in our rules and policies and quick answer page on website. Draft Dates may vary a day or two. Exact Date will be announced and will be on website's Gym Master Calendar page. When you register for a CLASS you are Enrolled Through the following MAY. GYMNASTICS TEAMS are enrolled through the following MAY. DYNAMITE CHEER is enrolled through the following April. To WITHDRAW your child you must give a Two week Advance Written notice of withdrawal to the Office. Email to Courthouse Gymnastics Co. will serve as a written withdrawal. You Owe for the week you give the written notice And for the following two weeks. VERBAL notice of withdrawal to a coach, instructor or to the Office is Not a withdrawal. NO EXCEPTIONS. PRIVATE LESSONS DO NOT HAVE TO GIVE A WRITTEN NOTICE TO THE OFFICE but should notify the Instructor. PRIVATE LESSON STUDENTS MUST BE ENROLLED IN THE CLASS "PRIVATE LESSONS". EMAIL: Email is our Primary Method of communicating with customers And all information is posted on our WEBSITE. Please keep your email address Updated. Check your Email and the Website Often for information about your account, events, closings and other important information. Emails will be sent to Parent's email. If Someone Else is Paying your child's tuition or bringing your child to class please Forward relevant emails to that person. DO NOT USE the COMMENTS box at bottom of Reg. Form for communication about classes, etc. We will not see it. EMAIL Us. By SIGNING below you are attesting that you are the PARENT OR LEGAL GUARDIAN of registered child(ren) and that you have Read, Understand and Agree to our Rules and Policies, all information posted on Courthouse Gymnastics website and all of above information. YOU MUST BE A PARENT or LEGAL GUARDIAN to Register Students. STUDENT WILL BE DROPPED FROM OUR PROGRAM IF YOU ARE NOT.